Time for a classic summer movie? Relive the adventure and magic in one of the most beloved motion pictures of all-time,E.T. The Extra-Terrestrial, from Academy Award-winning director Steven Spielberg. Captivating audiences of all ages, this timeless story follows the unforgettable journey of a lost alien and the 10-year-old boy he befriends. 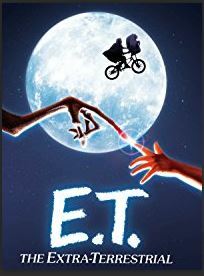 Join Elliot (Henry Thomas), Gertie (Drew Barrymore) and Michael (Robert MacNaughton) as they come together to help E.T. find his way back home.E.T. The Extra-Terrestrialis “one of the great American films” (Leonard Maltin) that forever belongs in the hearts and minds of audiences everywhere.